This is one of my grandma's dresses. It is not for sale! To the left is the dress I used as a pattern to design my own. 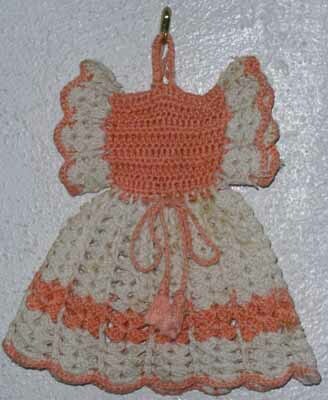 As a child, I sat at Grandma's feet making endless crochet chains while she whipped out variations of these dresses. The standard pattern called for a wooden spoon to go through the neck and a wooden fork went crosswise through the sleeves to make a "person" in a fancy dress, and it was usually used as a kitchen decoration. She also made some with a hanging loop that I guess were technically considered potholders (kind of thin ones, I'd think!) but were usually used as a refrigerator decoration. 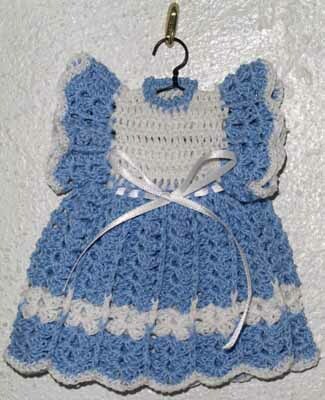 I thought it would be nicer as a cute little dress on a hanger, suitable for a decoration in any room. The above two are the ones I have completed so far. I am currently working on a shaded pink and white one right now. I can take orders for different colors. Comments: See color list for custom choices. Made with crochet thread and hung on a purchased miniature metal clothes hanger.. Colors: White/blue (shown), blue/white (shown), shaded pink/white, mint green/white, peach/white, white/peach (shown), white/pink, pink/white, white/violet, violet/white, ivory/hunter green, mexicana/yellow. Can also do any color you see listed for either the pinafores or washcloths. Size: Approx. 5" not counting hanger. 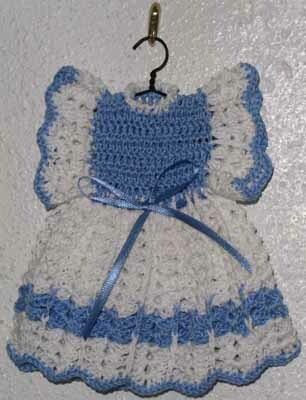 To order: Refer to "crochet dress" and above-listed color combinations. Custom: E-mail with requests for specific colors. Shipping: $1 for one dress, $.50 for each additional dress shipped at the same time.